Vintage Truck - Restored, this look is referred to as "patina"
Very interesting post treatment, certainly different to the run of the mill pp's !! Looks good in B/W !! I'm thinking, but not sure I'm correct that this truck's paint has been sanded down to the original metal, then your processing has added texture. Am I right? Nevertheless, I do love the look, and black and white is perfect for this photo. 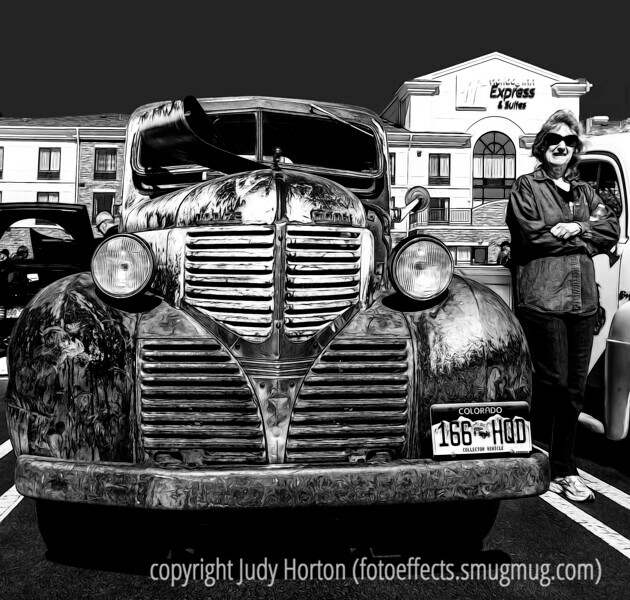 Was trying to figure out if "patina" was how the truck was restored or if it was your processing that gave that effect. I like the 'attitude' of the restoration, your composition and the processing. Like the whole package - a lot. It took me awhile to figure out what was blocking part of the windshield, but I got there in the end.